Leeds Stove Centre supply a large range of different wood burning and multi-fuel stoves to the Halifax area, with a huge choice of styles and finishes for every type of home, whether its a traditional home in a village, or a large and sleek modern apartment! A dedicated wood burner will be specifically designed without a fixed grate, but with a flat base. When you burn logs, it is more effective that new logs are placed on a bed of ash to provide maximum efficiency and heat output from your wood burning stove. We stock a range of contemporary and traditional styled wood burning stoves that would make not only a the perfect focal point but also an eco-friendly source of heat for your home. Leeds Stove Centre has a showroom which is located in Leeds. Here you can view our latest wood burning stoves and see live working models to help give you a feel of how your new wood burning stove would look and feel in your own home. 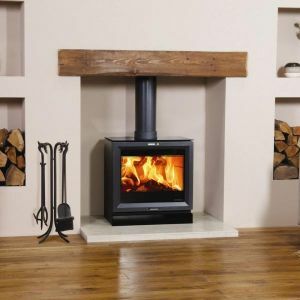 At the Leeds Stove Centre, our number one priority is to supply you with long lasting, quality built wood burning stoves. Therefore we only stock tried and tested brands which have reached our high standards for heat output and build quality. Some of the brands that we stock include Yeoman, Portway, Hunter, Dik Guerts and Morso, these brand have all met our highest standards. The variation of brands that we supply means that we have a large choice of designs and accessories to choose from, this means you are truly spoilt for choice at the Leeds Stove Centre! In addition to supplying high quality wood burning stoves to the Halifax area, we also have a number of highly trained installers who can install your brand new stove. You must ensure that your stove is installed by a recognised competent person who is appropriately qualified in the installation of stoves and that the installation complies with all local, national and European building regulations. All our engineers are employed directly by the Leeds Stove Centre and all are HETAS Registered. Please call us on 0113 255 5622 either to arrange an installation survey or for more details on installing a wood burning stove.